LAHORE: PFDC Sunsilk Fashion Week (PSFW) came to a close with its grand finale on Saturday evening. With some industry insiders and fashion heavyweights in attendance, the three-day extravaganza succeeded in giving an opportunity to debut designers, retail brands and renowned couturiers to perform their best. Needless to say, all design houses were given a platform to exercise freedom of expression which they exhibited through their design philosophies. Saving the best for last, PSFW wrapped up with fashion industry’s finest showcasing their collections. 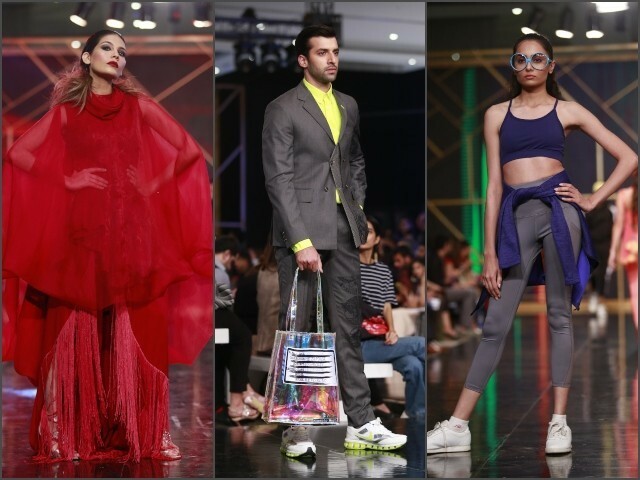 From Nomi Ansari upping the ante with a luxury activewear line to HSY paying tribute to his mother, the night ended on a high note to say the least. Here’s a lowdown of what went down on day three. 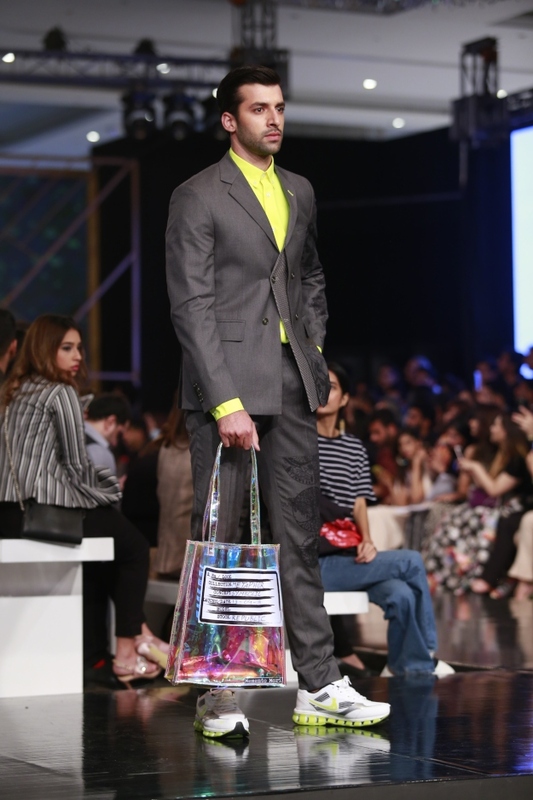 Labels including Khas, Almirah, So Kamal and Sanoor presented their summer collections, however, nothing really stood out in terms of design or print. There was no new fabric, design or embroidery that caught the eye. The western cuts were too complicated, with the material typically used for creating eastern lawn outfits. Overall, the pieces looked odd on the ramp. Brands should stick to their retail philosophy and create easy and simple cuts to attract the masses. 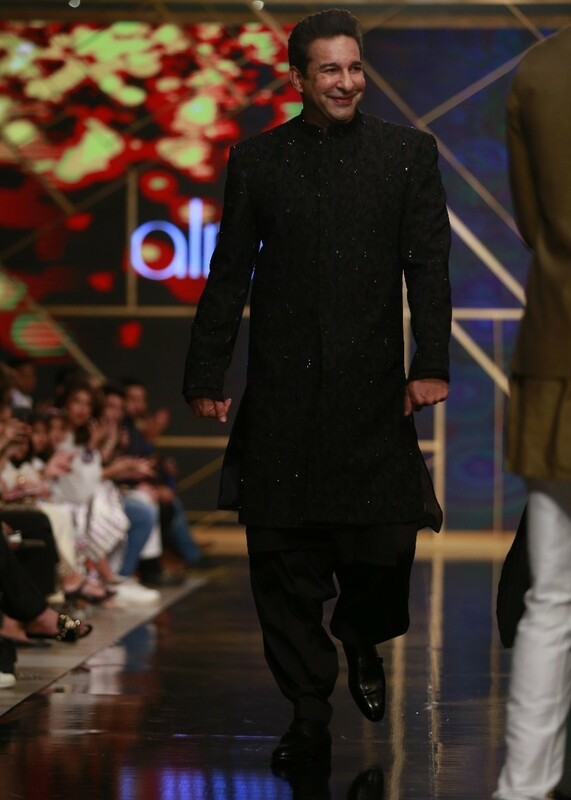 Former cricketer Wasim Akram walked the ramp for Almirah in an all-black embroidered sherwani and matching wide-legged shalwar. Actor Ghana Ali sported a black frilled off-shoulder dress in a Khas creation. Entailing easy to wear silhouettes, the line screamed style, glamour and decadence of the 80s. The runway witnessed animal and quirky prints in the form of jumpsuits, flowy gowns and flared trousers. 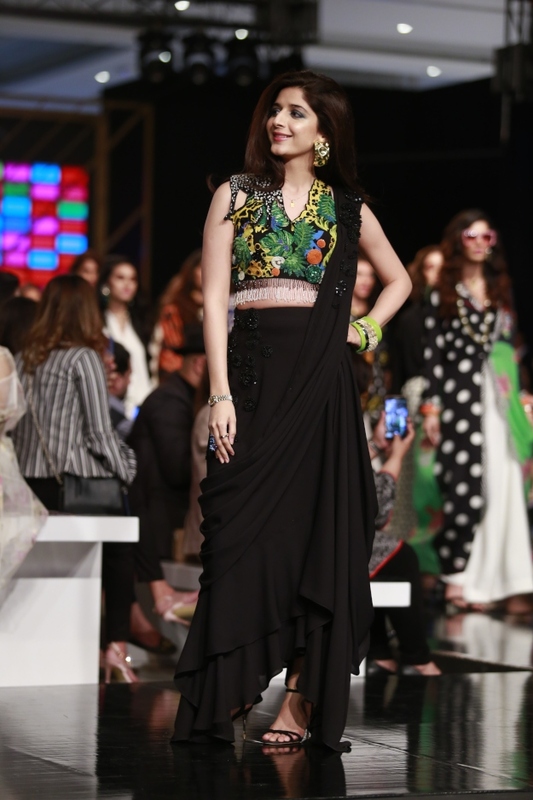 Starlet Mawra Hocane walked the ramp in a black fusion sari paired with a heavily embroidered and sequined blouse. Safe to say, Zaha was the most interesting show of the evening in terms of styling, silhouettes and patterns. Our favourite from the showcase was the leopard print voluminous gown that can be dressed up for an evening soiree or toned down for a semi-formal lunch. Another striking piece was the monochrome skirt, which could be paired with multiple options. Joining forces with Tuhura Athletics, the ace designer presented his debut luxury activewear collection. The limited-edition line was inspired by Ansari’s active on-the-go lifestyle. The offerings had a very retro feel, which is usually not a common find in sportswear. The collection had a range of tights in animal prints, monochromatic fierce neon sets and must-have metallic windbreakers. On a whole, it was a lively and fun show. 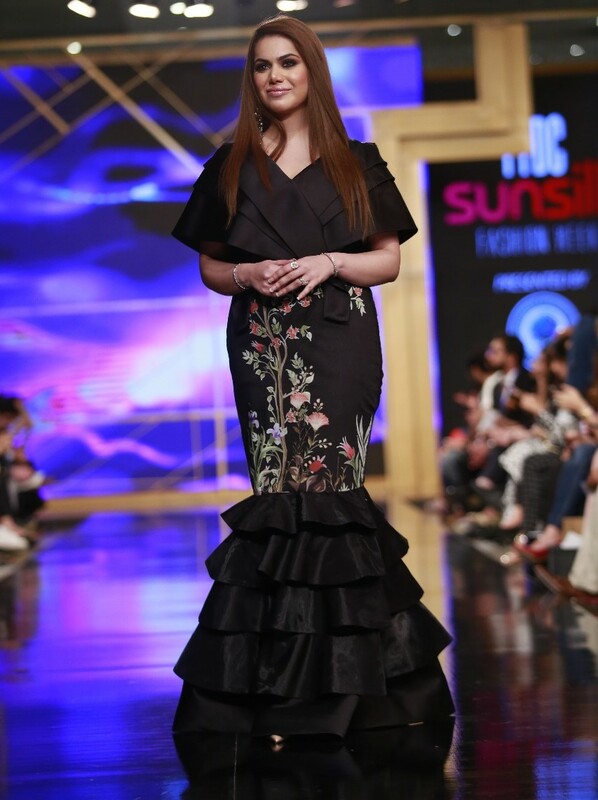 Young sensation Hania Amir closed Ansari’s showcase in sleek black and blue tights paired with a crop top. I loved the neon shades that all the models sported as the only prominent accessory and they surely made a statement. Republic presented a luxury street wear capsule collection with unconventional aesthetics. It comprised a palette of subtle creams, juxtaposed with fluorescent colours and a clever play on texture. The designer used various fabrics like knitwear, suede and solid cotton, which were incorporated with embroidery and print on garments. The brand presented great fashion options for menswear but was limited to those who like to experiment with fashion. While there were some questionable pieces, Farooq surely knows how to put a fun show together, whether it means tattooing his models or accessorising them with belt bags. 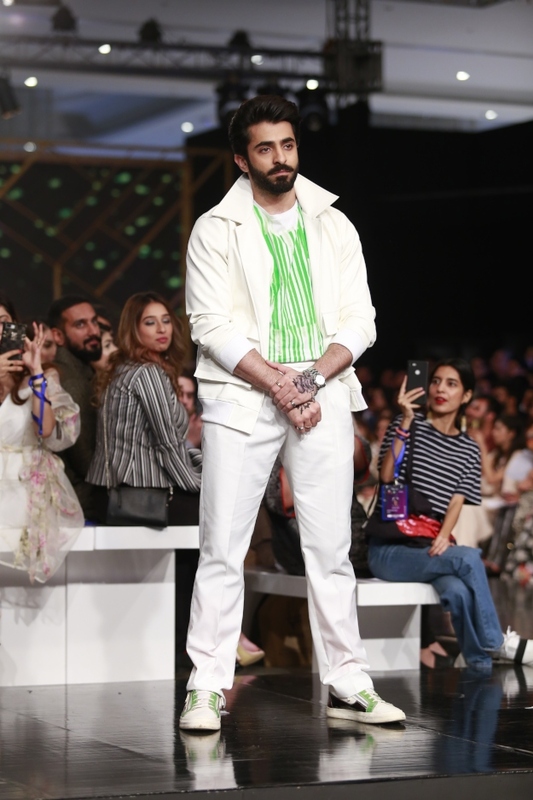 Actor Sheheryar Munawar wrapped up the show in white slim trousers paired with a matching contemporary jacket and a contrasting neon green knitwear shirt. The couturier cast his spell once again with the collection’s title based on his mother’s nickname. His showcase paid tribute to his mother and all the powerful and independent women of Pakistan. This year, HSY also completed 25 years in the fashion industry. And so, the ensembles dated back to the basics of designing, with all the patterns hand-made and hand draped. The collection was a manifestation of the brand’s original design essence, infused with eastern and contemporary silhouettes. Shirts featured varying hemlines and were made from fabrics like georgette woven out of silk yarn. All the outfits were mainly red, because the colour holds a special significance in HSY’s life as it was the first colour he saw when he regained his eyesight, 25 years ago. I did feel, however, the embroidery and patterns became a little monotonous as the show progressed.